Ours, believe it or not, have been filled with working out on the farm, mostly pruning apple trees (more on that for another time) because it has not been its usual ferocious cold and snowy time here at Chez Siberia. Ordinarily, we’d wait until most of the way through the winter but since a) we have discovered so many apple trees (and again, more on that for later) that need major weeding out that we’d never finish by the time they’d break dormancy in the spring and b)the weather has been basically so warm that we figured we’d get to it early when it’s a lot more pleasant to get it done (rather than standing out there in the wind and 25-degrees F with pole saws). While the DH, bless him, is up the hill attacking the apple trees (and since there are so many of them and they’ve been basically neglected since they sprouted out of the earth, the DH is taking the position that first, there is no way he can completely prune something into shape the first time – too much of a shock and second, since there are so many, he doesn’t have time to do that in any case), your old Aunty has been assigned a different pruning job, which is to remove some of the oldest ‘canes’ of the black current bushes (see the photo above). 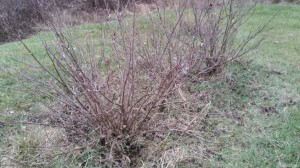 These must be at least 3 years old – probably closer to 5 – and since black currents blossom and produce fruit on their ‘new wood’, then every year, we should be removing some of the oldest wood. First, this gets rid of unproductive/less productive stems and branches and second, it sends a message, chemically, which tells the bush it’s been harmed, so it will send out new sprouts from the roots and branches which will blossom and bear fruit, which is what we want. 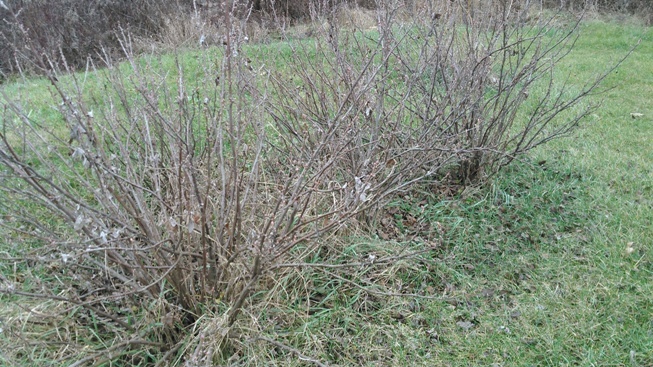 Now, again, pruning bushes works the same for black currents (and for flowering bushes such as forsythia and lilacs as well, if yours are getting leggy and not producing as many flowers as they used to – just make sure to do this to those sorts of bushes right after they blossom in the spring so that they have time to grow new wood and form blossom buds before the winter) as it does for apple trees, in that you don’t want to go at it with a chain saw or something like that and remove everything down to the ground. All that will do is remove all your productive canes and you won’t get any canes, blossoms or fruit for another couple of years !! What you want to do is, by eye, take out every fourth cane or so. Look down from the bottom (because that will be the oldest wood) and cut out one of every four. Then look down from the top and do basically the same for the rest. This will open up the bush, get air and sun into the centers which will help with blossoming and fruit set/ripening as well. 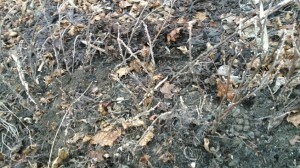 As you can see from the top photo – the bushes are pretty thick. Some of the ‘canes’ were actually about 1″ in diameter so using a hand pruner was rather challenging. After I finished (and I was a bit diplomatic with the pruners – I’m sure the DH would have been more aggressive than I was, but again, we can do more next year. That’s the good thing about pruning – if you go slow, then if you feel later that you haven’t taken out enough, then you can trim out more. 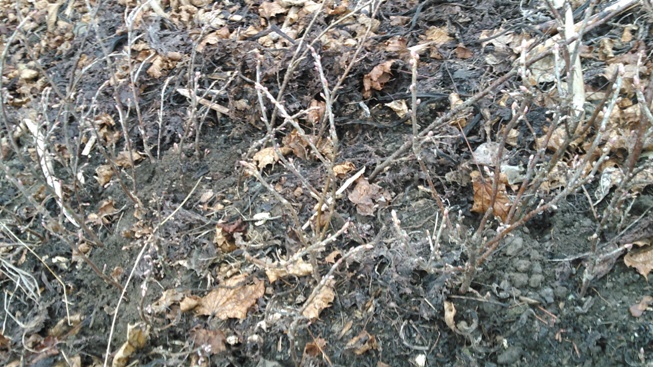 If you are too aggressive, you are stuck with no wood), the bushes looked like this: There’s a bit more air all over the place. We will be cutting out the next 1/4 of the oldest canes next year in any case, so we can take out more if we want to and tidy them a bit. Now, some people, when they prune out, will just burn or throw away the canes. And under ordinary circumstances, I probably would have also, but I wanted to try something. We only have five black current bushes and have wanted to put in more. I thought perhaps if I could get the cuttings into the ground now, before the ground freezes, perhaps some of them might root. This works with willows and who knows? So, I cut the cuttings so that the bases are the diameter of a standard elementary school yellow pencil and I stuck a whole bunch of them into the dirt in one of the garden beds (as you see in the photo) and we’ll see how they do. If nothing roots and they die, well, no harm done, but if some of them DO root — we’ll be that far ahead in terms of expanding our collection of black current bushes!! Again, I hope everyone is having a happy, safe and healthy holiday season. 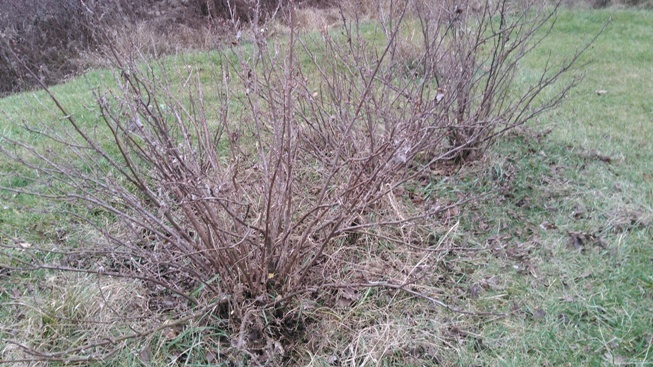 We’re anticipating the first big winter storm next week, which will bury my black current cuttings in the snow.